With the warm weather we bid adieu to oysters. For the next few months they'll be on the spawn as the water approaches temperatures fit for reproduction. Hence the old adage about not eating oysters in months without an "R": May, June, July, August. Like most adages, there's some truth at the heart of the matter, though in this age of carefully farmed shellfish, not a month goes by that you can't eat a tasty oyster. When oysters put their energy and fat reserves into sexual reproduction, however, their flesh becomes thin, watery, or even milky as the the reproductive organs take center stage. The milkiness is particularly off-putting to someone looking to slurp a raw oyster. While spawning oysters are not choice, they're not poisonous either, and sometimes in late spring you can find habitat where oysters will still be suitable for the table even as their brethren in other nearby locales are beginning to spawn. Such habitat will be at the lowest tide levels where the oysters aren't exposed to sun and tepid tide pools for lengths of time, and on beaches where colder water currents flush through the shellfish beds. Oysters in such areas have a shorter spawning window. Even so, I usually prefer to cook these oysters in the warm months. 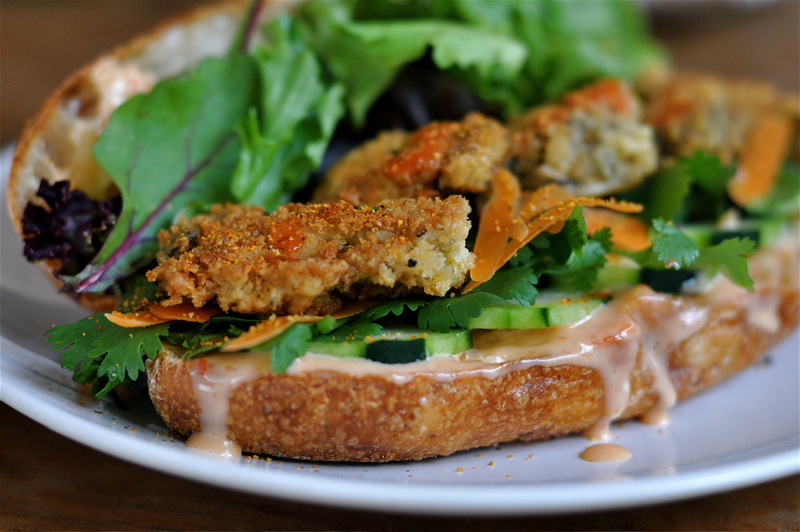 Here's a recipe for just such an oyster: a Vietnamese-style Bánh Mì sandwich. This hybrid of traditional southeast Asian and French cuisines dates to the French occupation of Indochina. In American cities with large Vietnamese populations, the Bánh Mì is known as a delicious—and cheap!—lunch option for those on the go. Various meats are arranged on a baguette along with fixings such as fresh cilantro, pickled carrot, cucumber, daikon radish, and so on, and usually glued together with a sauce of some kind, often mayo-based. Ideally the baguette is crusty with just enough of a soft interior to cradle the meat. I've never seen an Oyster Bánh Mì at my usual Vietnamese haunts. This is one sandwich you'll have to make yourself. Typically a Bánh Mì is scarfed down solo while hurrying to an appointment, but I've written the ingredients below to serve two at home. 1. To make sauce, mix together equal amounts of sweet chili sauce and mayonnaise. Add hot sauce to taste. 2. Dip oysters in egg, then dredge in mixture of panko and flour. 3. Fry oysters in butter over medium heat. Remove to paper towels. 4. Slice baguettes lengthwise. Slather with sauce. Arrange oysters and fixings.